Syabas, well-known producer of networked media tank Popcorn hour, is going to release the media player for non-geek users. Because NMT Popcorn Hour is not easy configure and user friendly device. Also it’s expensive a bit regardless the rich set of offered features. So, the new Popbox is a compact and elegant box with redesigned rich user interface. It still can play all known media files and containers from attached USB storage or network shares (it doesn’t have internal HDD). Popbox support wired connection to the home network as well as WiFi (802.11 b/g/n). Sure the device is fully compatible with HD (720p or 1080p). Another good advantage of Popbox is access to the online services such Twitter, Revision3, Netflix, SHOUTcast via built-in apps. The number of apps is growing fast. Thanks to available App Development Platform. So, if you’re interested to add new app you can do it easily. Also the Popbox allows to you organize your media library more efficient by retrieving metadata from IMDB for video or AllMusic for audio files. 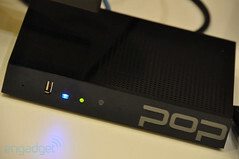 The Popbox should be available this Spring at just $130! If the price won’t be changed it’ll be probably the best network media player on the market!